The body of knowledge about Alzheimer's disease is mainly based on research on rare familial forms of the disease. Genomic analyses now provide information on gene variants of the common sporadic form – a glimmer of hope for a more precise diagnosis process and new treatments. With Alzheimer’s disease there are basically two different forms: the very rare, genetically determined or familial, and the non-familial or sporadic form which includes more than 95 percent of patients with Alzheimer’s disease. In the familial form, relevant mutations in three genes have been described. These are the genes for the amyloid precursor protein (APP) and the genes Presenilin 1 (PS1) and Presenilin 2 (PS2). Amost all patients with mutations in one of these three genes develop the condition – and usually after 30 and before 60 years of age. In addition, there are genetic variants which are associated with an increased risk for Alzheimer’s disease. The best known is a variant of the gene with the blueprint for the apolipoprotein E (APOE). There exist for this gene three common variants: APO-e2, APO-e3 and APO-e4. About 15 percent of the population are carriers of APO-e4 alleles. Up to two thirds of patients with clinically diagnosed Alzheimer’s disease are APO-e4 positive. Among healthy people, the percentage is, however, some ten percent. 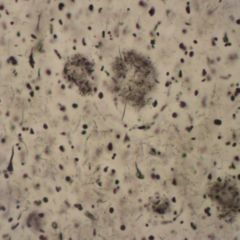 According to a current, newly published study in the Archives of Neurology, APO-e4 is not however only detectable in Alzheimer’s patients, but also in patients with other neurodegenerative diseases which are or may be associated with dementia, such as Parkinson’s disease and Lewy Body Dementia. A large part in the ideas about how Alzheimer’s disease develops is based on research results that are obtained from the rare gene mutation-determined early forms of the disease. This particularly applies to the concept of amyloid pathogenesis. 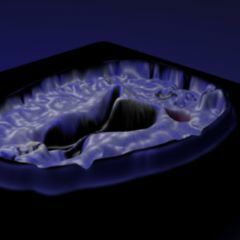 Yet it is unclear to what extent the conformity in pathophysiology is between the rare Alzheimer’s forms and the far more common, genetically very complex sporadic disease “which is currently developing into a world extremely threatening disease epidemic”, explain Alzheimer’s researchers Professor Harald Hampel (University of Frankfurt am Main) and his colleague Dr. Simone Lista (Nature Reviews Neurology). Moreover, the non-familial form of Alzheimer’s disease is probably no homogeneous disease, since individuals are not only genetically very different, but they are also subject to varied environmental influences during life; they have different lifestyles, which act on the genome. Therefore it can be assumed that with the sporadic Alzheimer’s disease several genetic and biological subtypes occur, explain Hampel and Lista. The consequences of this could firstly lead to differing biomarker profiles, secondly the need to develop customised or individualised treatment approaches could also be inferred – just as in oncology. Against this background, the growing evidence of the so-called genome-wide association studies on sporadic, i.e. non-familial Alzheimer’s disease is increasingly gaining importance. Already in 2011 an international research team also involving participation of German researchers such as Hampel, Jens Wiltfang (Essen) and Johannes Kornhuber (Ulm) were able to identify five new “impactful” risk variants which are associated with Alzheimer’s disease (Nature Genetics). Recent studies with the aim of discovering less common, but still very effective variants actually reveal: there are with this disease not only very rare genetic variants with relatively low impact on pathogenesis, but especially those that are associated with relatively large “effects”. An example of such a rare but “powerful” gene variant is the one that the group under Professor Kári Stefánsson, head of the company DecodeGenetics, discovered (Nature). Something makes the discovery of the Icelandic gene researcher special: a point mutation which was found in the gene for the amyloid precursor protein (APP), which is not associated with an increased but rather reduced risk of Alzheimer’s disease. According to the investigations of the team under Stefánsson, the carriers of the mutation do not only have a better chance of reaching an old age. Their chances especially of getting to 85 years of age without them being diagnosed with Alzheimer’s disease are considerably greater. In any case, this point mutation is extremely rare: the investigation of 1,795 Icelanders found among Alzheimer’s patients a rate of 0.13 percent; among the elderly without Alzheimer’s disease they made up 0.62 percent. One possible consequence of these research findings is not only that enhanced therapies ought to be developed which are directed against the beta-amyloid fibrils or tau-protein fibrills, perhaps it is necessary to take “two or even multiple tracks” he says, going on to put it more bluntly. Such effective anti-inflammatory strategies have for some time already been sought; Clinical Trials with antiinflammatory agents, for example, NSAIDs and statins have, however, turned out disappointing (Agnes Flöel (Eds): Alzheimer’s – unabwendbares Schicksal? Schattauer-Verlag Publishers, Stuttgart 2012). 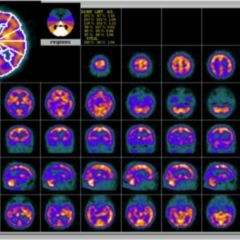 Whether an already available immunoglobulin preparation, with data derived from a 24-patient study using it and presented at the 2012 Congress of the Alzheimer’s Association in Vancouver, fulfills what has been hoped, is uncertain. This also applies to one approach about which researchers at the Charité and the University of Zurich reported in Nature Medicine a few weeks ago. 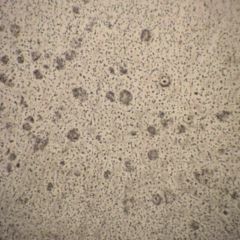 The teams led by professors Frank Heppner (Department of Neuropathology at the Charité) and Burkhard Becher (Department of Experimental Immunology, University of Zurich) have been able to demonstrate that using antibodies against a molecule (p40) of the microglia-derived cytokines interleukin 12 and 23, the plaque accumulations in the mouse model of Alzheimer’s disease are reduced. Further investigation revealed that this antibody therapy against the cytokines alleviates cognitive deficits in animals already affected by Alzheimer’s disease. Heppner and Becher do not suspect that the cytokines interleukin 12 and 23 play a causative role in the pathogenesis of the disease. It is nevertheless certain that beta-amyloid induces inflammatory processes. And although the importance of the p40 molecule remains to be clarified further, according to the researchers it is now justifiable to test the approach in human studies. One thing is clear: there is no reason now to have the genome sequenced in order to find out whether one has an increased or reduced risk of Alzheimer’s disease. For what should or could a healthy person currently do with the information that their personal risk is heightened or diminished by a few percent? There exists to date still no truly effective and widely accepted therapy or prevention through which this risk could be reduced. And a reduced risk should not be a kind of carte blanche for one to maintain a dementia-promoting and at the same time heart-endangering lifestyle, to be neither physically active nor feed oneself reasonably healthily so that blood pressure, weight and metabolism remain in balance. And what is also true: The current results of the genome analyses support the view that the sporadic form of Alzheimer’s disease is a genetically highly complex disease with multiple subtypes (Nature Reviews Neurology). Until all facets are discerned, the “hunt” for further genetic variants still has to go on for some time. After all, it began long ago – and it’s being done at lightning speed.